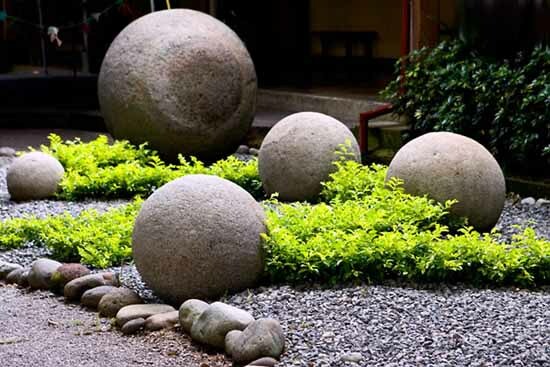 The stone spheres of Costa Rica are a collection of some three hundred polished stone orbs, the first of which were discovered in the Diquis Delta of Costa Rica during the 1930s. The spheres range in size from a few centimeters to over two meters in diameter, and weigh up to 16 tons. Most are sculpted from granodiorite, an igneous rock similar to granite. Their precise date of construction is uncertain, but they are believed to have been carved between 200 BC and 1600 CE. They have been uncovered in a number of locations, including the Isla del Cano. The story of the spheres' discovery began in the early 1930s as the United Fruit Company was searching new grounds for banana plantations. A disease threatened the health of their crop on the Caribbean side of the isthmus. Searching the Pacific side, they found promising land within the Diquis Valley, not far from the coast where exports could be undertaken. They moved their headquarters from Lim—n to Golfito. When the United Fruit Company arrived, the town of Golfito was a simple fishing village on the eastern periphery of the Golfo Dulce. However, it was soon connected by rail line to the larger town of Palmar Sur, some eighty kilometers away. The stone spheres came to light during early cultivation of the farmland. Most were discovered by workmen as they cleared and burned the jungle in preparation for planting. Recognizing the stones as man-made, the workmen pushed them aside with bulldozers and heavy equipment. At some point thereafter, they returned to the stone balls, and, inspired by stories of hidden gold, began to drill holes into them. Within the drilled holes they inserted sticks of dynamite, which they would use to remove stubborn roots and stumps. Unfortunately, several of the spheres were destroyed before authorities intervened. Some of the dynamited spheres have been reassembled and are currently on display at the National Museum in San JosŽ. The first scientific investigation of the spheres was undertaken shortly after their discovery by Doris Stone, a daughter of a United Fruit Co. executive. These were published in 1943 in American Antiquity, attracting the attention of Dr. Samuel Lothrop of the Peabody Museum, Harvard University. In 1948, he and his wife attempted to excavate an unrelated archaological site in the northern region of Costa Rica. The government of the time had disbanded its professional army, and the resulting civil unrest threatened the security of Lothrop's team. In San JosŽ he met Doris Stone, who directed the group toward the Diqu’s Delta region in the South-West and provided them with valuable dig sites and personal contacts. Lothrop's findings were published in Archaeology of the Diqu’s Delta, Costa Rica 1963. Numerous myths surround the stones, such as they came from Atlantis, or that they were made as such by nature. Some local legends state that the native inhabitants had access to a potion able to soften the rock. Another calls for the center of the spheres to contain a single coffee bean. It is wrongly believed that the spheres are perfect. However they do have a surprisingly smooth surface. According to laser measurements by researchers from the University of Pennsylvania, the spheres were 96% perfect. The stone spheres have been found in clusters of up to twenty, and often in geometric patterns such as triangles, rectangles or straight lines. Such alignments often point to the earthÕs magnetic north. A large number of the spheres have been located in the Diquis River Delta, with other popular sites being the southern cities of Palmar, Sur, Buenos Aires and Golfito as well as in the province of Guanacaste to the north and in the central valley. Archaeologists have been able to date the stones by the artefacts that have been found lying alongside them. Some of them have, thus, been dated as far back as 400 B.C.E. The majority of them have, however, been dated between 800 and 1200 B.C.E. Many of these stones have been found near the remains of dwellings and in close proximity to grave sites. Some believed that the stones contained some hidden treasures and a few of them have been smashed to try to get at this supposed treasure. None has been forthcoming, however. Despite these losses, however, the National museum of Costa Rica has catalogued some one hundred and thirty existing stone spheres. However, many of them are not catalogued. This is because of the fact that many of the spheres have been removed from their original sites and used as ornaments in private homes, gardens and churches. Clearly, there are also many stones that still lie undiscovered. 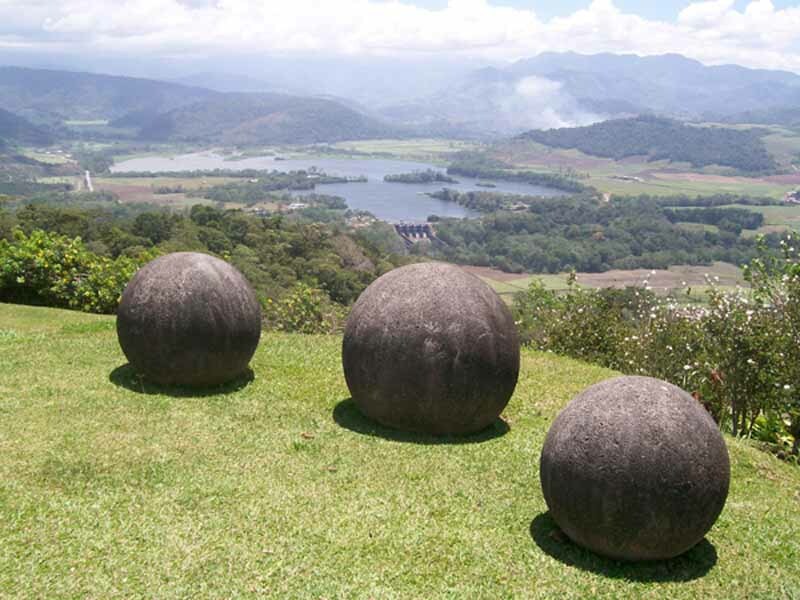 Just how the ancient people of Costa Rica made these perfectly cylindrical stone spheres, remains largely a mystery. It is clear that some sort of mechanical procedure was needed in order to attain the precision displayed by the stones. Statues emanating from the same period show that the ancient Costa Ricans were very skilled sculptors. The existence of gold artefacts from about 800 C.E. also show that the people living at that time were experienced at working with high temperatures. It is, therefore, believed by some researchers that the stones were moulded into their perfectly cylindrical shapes by extreme heating followed by cooling, to remove any outer layers of rock. The rocks could have been finished by polishing with sand or leather. The larger stones were clearly crafted by the most skilled sculptors. These stones are so perfectly shaped that the tape and plumb bob measurements of diameters reveal no imperfections. This shows that the makers of the stones must have had a degree of mathematical ability as well as advanced knowledge of stone carving and the use of tools. The ancient Costa Ricans, however, had no written language. There is, therefore, no written record of just how they made the stones spheres. Many of the spheres are made of granite like rock. Yet the granite rock quarries were often twenty five to thirty miles away from the location of the largest stone spheres. How, then, did the sculptors move such heavy stones? Some of the stones, after all weigh sixteen tons. If the granites rocks were moved before they were sculpted, then the nine foot cube that would be needed to sculpt a sphere eight feet in diameter would weigh a whopping twenty four tons. To even get such a massive stone to itÕs final location the natives would have to cut large tracks through very dense bush. Other stones were made of coquina, a limestone like material which is found on the beaches near the mouth of the Diquis river. This stone was probably rafted up river about thirty miles to itÕs final location. 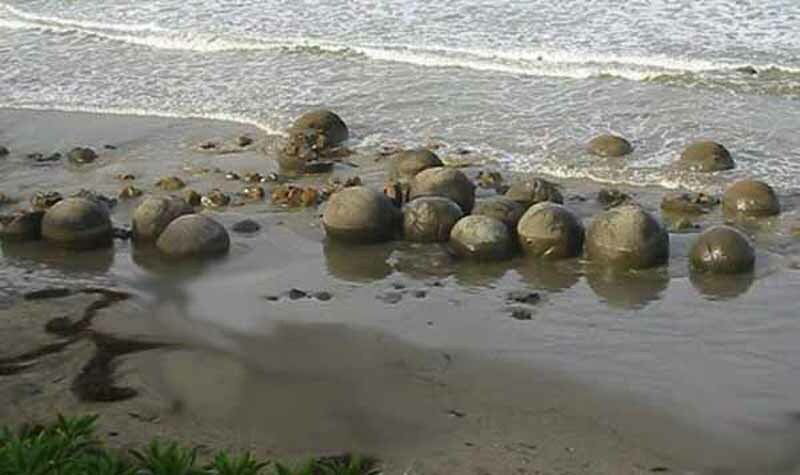 Some of these stone spheres have been found on Cano Island, which is located about twelve miles off the Pacific coast. As to why the stone spheres were made, there are, as yet, no explanations. It is possible that they were used as a symbol of rank or importance for a tribal chief or a village. Then again, they may have been used as religious or ceremonial symbols. Perhaps further study by archaeologists will unravel the secrets of the stone spheres of Costa Rica.